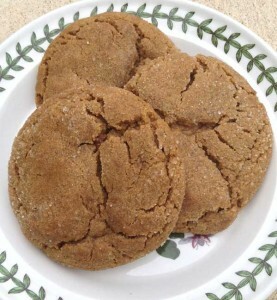 Giant Ginger Cookies that are soft and chewy in the center and have crispy edges. In a large bowl, using an electric mixer beat shortening, sugar, egg and vanilla until light. Beat in molasses. In a separate bowl, mix together flour, salt, baking soda, cinnamon, cloves and ginger. Stir flour mixture into sugar mixture until thoroughly combined. Scoop dough and shape into 9 large mounds. Place dough mounds in refrigerator and chill for about 2 hours. Preheat oven to 350 degrees F. Line two cookie sheets with parchment. Dip dough mounds in crystal sugar (if using) and arrange 5 mounds on a baking sheet lined with parchment paper. Bake for 13-15 minutes or until cookies appear set in the middle and are starting to brown around the edges. Let cool for 2-3 minutes on cookie sheet. Cookies will be large, thick, crispy on the outside and soft on the inside. If you are making these with regular Crisco, use ¾ cup (144 grams) – Crisco weighs less per T.